Technology brands including Intel and IBM have been quick to jump into the social conversation with a tongue-in-cheek brand approach after a blackout struck the annual Consumer Electronics Show (CES) in Las Vegas. The blackout in the Las Vegas Convention Centre’s Central and South Hall bridge meeting rooms occurred at approximately 11.13am local (Pacific) time on the second day of the show. While power within the South Hall was restored minutes later, it took two hours to fully restore power in the Central Hall, with conference organisers confirming on Twitter at 1.09pm that power was slowly being rolled out in the Central Hall. In a statement, CES organiser, the Consumer Technology Association, blamed the outage on recent heavy rainfall which caused condensation on the venue’s roof to short circuit one of the facility’s transformers. “The power has gone out in the central hall at CES… sending thousands of attendees out of the LVCC, shutting down hundreds of expensive marketing activations and reminding us that none of this stuff works without electricity,” he tweeted. Another attendee, Derek Kerton, asked which brands were going to make the most of the blackout opportunity on their stands, and compared the situation to the blackout during the US Super Bowl. Oreo’s quick and clever response on Twitter, ‘Power out? No Problem. You can still dunk in the dark’, continues to be heralded by many as a great example of real-time social media engagement. Worry about outages? We don't. 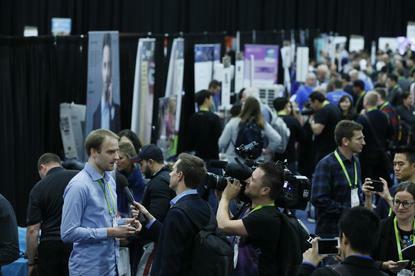 This year’s CES is expected to attract more than 180,000 visitors, has 4000 exhibitors and runs from 9 to 12 January 2018.